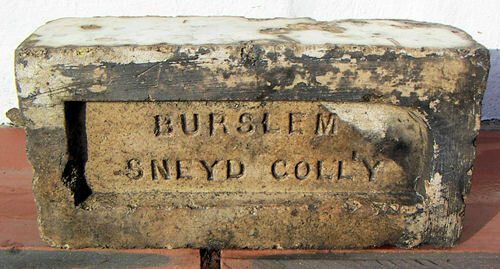 The manufacture of these glazed bricks was a large branch of business for the Sneyd Colliery Brickworks. They made coloured and white glazed bricks which were used in many buildings all over the world. They were used extensivly in London, e.g. The Law Courts, Windsor Castle and many railway and underground stations. 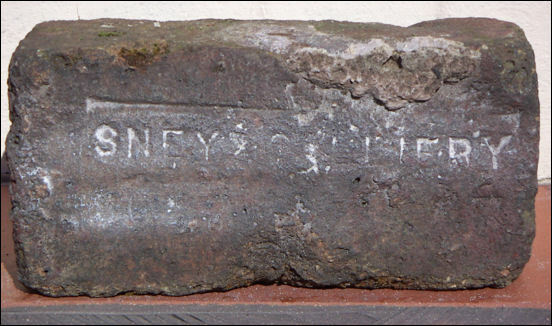 The glazed bricks were also used in Hotels, Railway Stations and Public Toilets in North Staffordshire. The glazed bricks, along with the hard Staffordshire Blue and Red bricks were in great demand and kept the company in business until the 1960's. 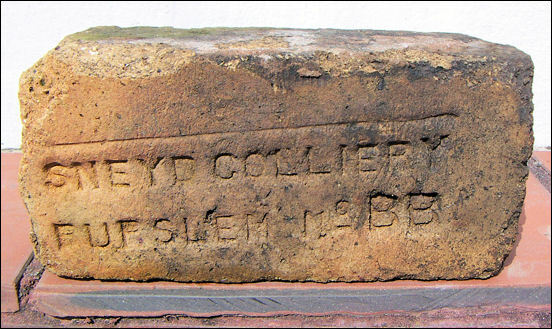 These two bricks are early examples of bricks from the Sneyd Colliery Brick Works - they are solid with a flat surface, no frog or locating holes. "The Sneyd Colliery and Brickworks Company, Ltd., constitute one of the most considerable industrial industrial establishments in North Staffordshire, both on account of the extent and of the importance of the varied operations in which they are engaged. 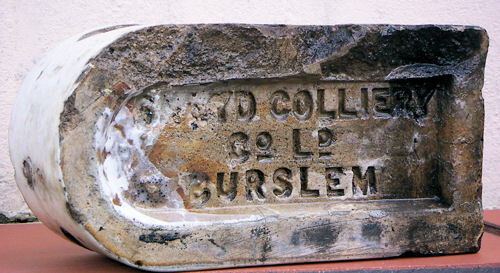 The Company took its origin parly in the present century with the Sneyd Colliery Company who were very large coal owners in this district. The business was afterwards curried on, from 1844 to 1875, by Messrs. C.and J. May. In the latter year it was purchased by Messrs. William Heath, Arthur Dean and W. A. M. Telwright, and was converted into a limited liability company in 1881. A thoroughly representative Board of Directors has been created, including William Woodall, Esq. M.P. (Financial Secretary to the War Office in the present Government); William Heath, Esq. : W. A. M. Telwright, Esq. ; Arthur Dean, Esq. : and J. Wilcox Edge, Esq. J.P. The secretary is Mr. John Mayer; the colliery manager, Mr. John Heath ; and the manager of the brickworks, Mr. S. Webster Dean. Under the management of the present proprietors, both the colliery and brickworks departments of the business have been developed with characteristic energy and enterprise. They have sunk two new shafts to a depth of over six hundred yards, and considerably widened a third. They have, too, laid down new machinery and other plant of the most improved description; and they have the best pair of winding engines in North Staffordshire. The pit-frame is steel, and the other appliances are all of the most modern description. There are eight different seams of coal; and the capacity is such that the Company can turn out 10,000 tons weekly. There are about six hundred acres to each seam. The various seams worked are as follows — the Burnwood seam, the Mossfield seam, the Harmine seam, the Holly Lane seam, the Bowling Alley seam, the Main seam, the Sevenfoot seam, and the Greatt Row seam. The Company have seams of excellent house coal, also second house coal and steam coal—the latter being chiefly used in the immediate district. The house coal is sent into the general market, where no product has gained so high a reputation as the Mossfield coal. The various buildings at the pit-mouths are lighted by electricity. The manufacture of glazed bricks, coloured as well as white, is a very extensive branch of business with the Company, the special points aimed at being the manufacture of a brick that is indestructible by natural influences or natural forces; that is, a brick that is impervious to the usual destructive agencies of weather, climate, etc., and one that can resist the heaviest pressure that would he brought to bear on it as a building material. 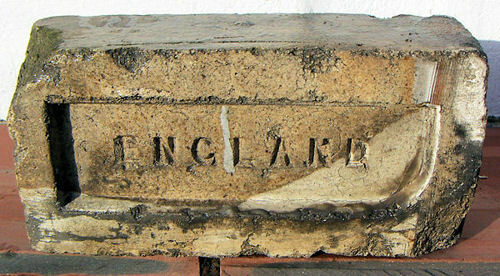 The characteristics of a good glazed brick, the Company lays down, are the firm adherence of the enamel to the body of the brick; the capability of that body to resist a heavy pressure and thus prevent the edges of the bricks chipping or flying when subject to such pressure; while another point is the purity of the enamel. Much time and exhaustive study has been devoted to the composition and preparation of the various enamels now used by the Company, and the above results have been completely obtained. 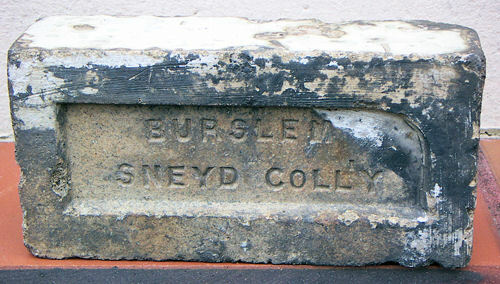 A glance at the list of the names of buildings in which the Sneyd bricks have been used, will show that they must have been brought as near to perfection as is possible Among other, contracts in which they have been used are the following:—Windsor Castle and the New Post Office Buildings, London, by H.M. Commissioner of Works ; the new Law Courts ; the Tivoli Restaurant, Strand, W.C.; the new stores in Huish Court and Water Lane, Blackfriars, etc., for Messrs. Spiers & Pond, Ltd. (this building is faced outside with coloured glazed bricks and lined with white) by Messrs. Hargreaves & Matear, by railway engineeers, and many more too numerous to detail here. The siding, which has been admirably laid out by the colliery manager, Mr. J. Heath, runs from the colliery right through the centre of the brickworks, thus affording splendid facilities for transport. The Company issue illustrated catalogues of their products, which should be in the hands of all builders and architects. Their depot at the new St. Pancras Goods Station (Somers Town Station), London, is second to none in point of size, accommodation, and the comprehensive character of the stock the Company keeps there. The stock of glazed bricks there is so large and comprehensive that there is no likelihood of the largest contract the Company may take in London not receiving a sufficient and regular supply. A large and varied stock of fire bricks, fire tiles and lumps, boiler seatings, flue covers, white and coloured glazed tiles. Staffordshire blue and red bricks, is also kept at this depot, which thus forms a most valuable adjunct to the building trade of London."